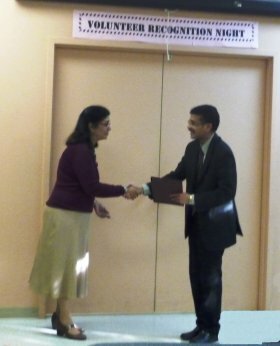 India Rainbow Community Services of Peel held its annual ‘Volunteer Appreciation’ evening on April 25, 2012 to thank and acknowledge the many volunteers who have contributed to the success of the organization through their hard work and dedication. Kitty Chadda, Executive Director, welcomed the guests, and thanked all the volunteers who so selflessly gave of their time, talents, knowledge and energy to serve our diverse clientele in the past year. perspective, our volunteers contributed a staggering 33,491 hours, roughly equivalent to 19 full time positions!” We need volunteers to help deliver appropriate support to our clients, and in return, we help volunteers develop their own skills and enhance their self-development. Our volunteers attended training sessions and awareness workshops, as well as educational seminars organized by India Rainbow on topics such as Menu planning, Osteoporosis – Bone Health, Eat Well for Less, Sun Skin care, Health & Beauty, Advance Care Planning, and Heart & Stroke. college and university students, those receiving benefits from Ontario Works, some referred by Youth Correctional Services, retirees, and newcomers to Canada. All members of the volunteer Board of Directors and the Policy Advisory Committee of the organization were also acknowledged for contributing their time, hard work, expertise and dedication. Congratulatory messages from MPs were read out by Kiran Rehan, Program Manager, Senior Services. Each volunteer was presented with a ‘Volunteer Recognition Certificate’. 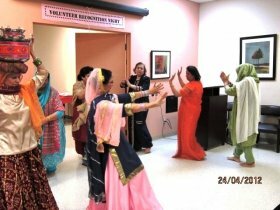 Entertainment in the form of ‘Sambelu’ – an Indian folk dance from the Gujarat region of India, a comedy skit, as well as ‘Gidha’ – a Punjabi folk dance, all performed by seniors, kept the guests entertained through the evening. In closing, Sushil Sharma, Senior Manager, Seniors Services, once again thanked all the volunteers and board members for attending and for their ongoing support and contribution.